Fish flesh is increasing in radioactive concentration hourly. 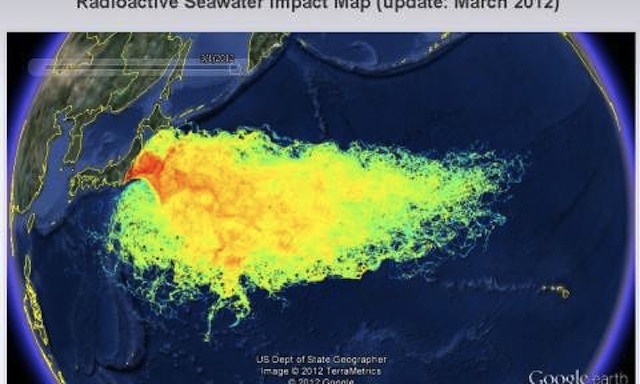 The Fukushima nuclear power plant continues to pour poisons into the Pacific. nuclear power plants, radiation from nuclear bomb testing, depleted uranium and radiation from conventional bombs as well as atom bombs. daily. For decades, coastal countries consuming the most fish have had the most cancer but the problem is multiplying now. Are all anglers stranglers? No.. some are smashers. In reality the high mercury levels in fish cause memory and mental function loss. There is no natural bulk in fish. It is naturally constipating. factory farmed and ocean fish are eating the parts of other animals. are the number 2 (yes) cause of hepatitis. of toxins in commercial pet food. are inflicting pain on animals. about the toxic effects of meat, fish, and animal products. A dolphin photographer as he was scuba diving saw 3 dolphins herd a shark away from him. The Japanese continue to murder untold tens of thousands of dolphins yearly, with knives and other methods, considering them competitors for fish. The pollutants of the world have filled the sea with so many pcb's,pbb's, so much arsenic, chromium, mercury, nuclear waste, etc. that in some cases marine mammal milk has become contaminated. 'The fisher also shall mourn and all they that cast angle into the brook shall lament and they that spread nets upon the waters shall languish."